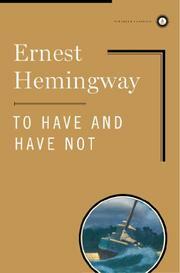 A somewhat puzzling book, but -- all in all -- it is good Hemingway, and a sure sale. Key West and Cuba form the settings for a tough story of men at the end of their tether, grasping at any straw, regardless of risk, to turn a few dollars. Rum-running, smuggling aliens, carrying revolutionary arms. Gangsters, rich sportsmen, sated with routine, dissipated women and men -- they are not an incentive to belief in the existence of decent people. But in spite of the hard-boiled, bitter and cruel streak, there is a touch of tenderness, sympathy, humanity. Adventure -- somewhat disjointed. The first section seems simply to set the stage -- the story starting after the prelude is over. The balance forms a unit, working up to a tragic climax and finale. There is something of The Sun Also Rises,and a Faulkner quality, Faulkner at his best. A book for men -- and not for the squeamish. You know your Hemingway market. His first novel in 8 years.